In the Star Wars universe, firing up the deflector shields is no big deal. Imperial cruiser on your tail? Deflector shields. Incoming TIE Fighter? Better flip on the deflectors. Science fiction has the luxury of positing neat technological ideas without necessarily explaining how they work if they could even work. A group of students from the University of Leicester have thought long and hard about what it would take to build a deflector shield in real life, and it turns out to be possible as long as you’re willing to make a few sacrifices. The paper, published in the student Journal of Special Physics Topics, details a means by which plasma could be used to create a barrier around a ship, or other object, which could deflect certain kinds of energy. The basis of this approach to inventing science-fiction tech is very real. We already make use of the same physics described here when bouncing communication signals off the plasma present in the upper atmosphere in a layer known as the ionosphere. If you want to send a radio frequency signal to a location on the Earth’s surface that is over the horizon, scientists have long known it can simply be bounced off the ionosphere. It’s a bit like a mirror for electromagnetic radiation. You want the same property in a deflector shield. The students used the ionosphere as the seed for the hypothetical shield described in the paper. Essentially, if you can wall yourself off with plasma, it can be used to deflect electromagnetic radiation, like a directed energy weapon (a laser or something similar). The design of this s-style shield relies on high-power magnets, which would be used to contain a wall of plasma around the vessel. The more dense this plasma is, the higher the frequency of electromagnetic radiation (i.e. power of the laser) it can protect you from. On the face of it, this sounds like a cool idea, and it’s technically feasible with today’s technology. Although, there are some drawbacks that make it impractical without crazy, futuristic technology. 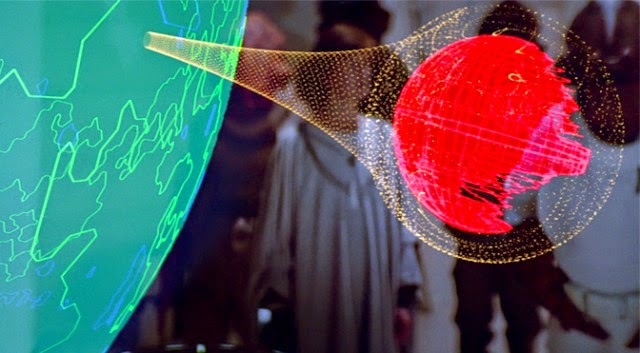 The first roadblock in implementing a plasma-based deflector shield is that a magnet powerful enough to hold a bubble of super-hot plasma in place around your craft would be gigantic and consume a huge amount of power. Maybe that’s no big deal if you assume some sort of magical sci-fi tech, but the other issue with this shield is rooted in the fundamentals of physics, which aren’t so easy to explain away. Maybe these things were giant magnets. Let’s say you build this deflector shield, and you want to protect yourself from a laser beam. You flip it on, and sure enough, lasers bounce right off. However, the shield works equally well in both directions, so you can’t return fire either. In fact, since the plasma blocks all frequencies at or below the threshold dictated by its density, you probably won’t even be able to see past your own deflector shield. That’s not exactly the ideal scenario for defending yourself. The students concede that this probably isn’t going to be how we bring energy shields to life, but the technology might have other applications in the future. Or maybe a long time ago in a galaxy far, far away.